Tencent, the largest Internet company in China and best known for their instant messenger product QQ, today announced the launch of version 1 of their QQ International (QQi 1.0) IM. The international version of China’s most popular IM is now available in English, Japanese and French and is intended for users worldwide to connect with their Chinese friends, clients, customers, or just about anyone anywhere in the world. 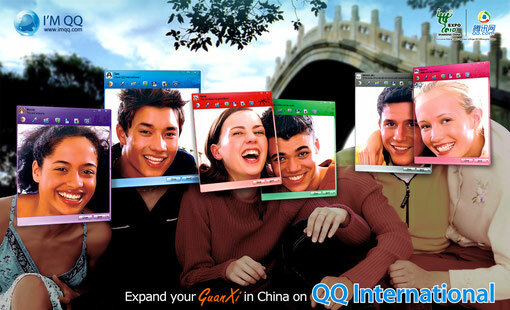 The client can be downloaded for Windows based PCs at www.imqq.com. Additionally a light version of QQi with stripped down functions is available for Mac, iPhone and iPad. The Chinese version of QQ currently has around 600 million active accounts. Marc Violo, Product Manager of QQi, said that the beta version of the multilingual client which was targeting foreigners living in China only, reached over 2 million registered accounts with an average of 170,000 daily unique users in and out of China. Competition for MSN and other international IMs? According to Marc Violo QQi is not looking to compete with existing multilanguage IM's such as Microsoft MSN or Skype but aims to target the sofar unserved niche of cross-border/cross-language communication between China and the rest of the world. Apart from its core IM functionality, QQi offers its users a variety of free apps to explore anything China related from job opportunities, news or language learning tools, to events, travel deals, directories and videos. The service has already partnered with a range of large local partners, such as the travel portal Ctrip.com or local news paper ChinaDaily.com and will in the future integrate more third party apps from local and global players. The far more momentous news compared to the QQi 1.0 launch is however that at the same time Tencent also announced the coming launch of a new English language SNS as early as January 2011. According to the press release the service will be integrated into the existing information portal www.imqq.com and seamlessly synchronized with the QQi IM. Those familiar with Tencents history will remember that also domestically it first was the IM product that was used to penetrate the market before adding more web and mobile services such as QZone, which eventually developed into China's largest online social network. It remains to be seen if QQi will indeed just stay a community platform for China-related topics or if Tencent will eventually try to compete with global social networks, foremost Facebook. The company holds around 10 billion RMB in cash reserves and a 10% stake in Digital Sky Technologies Ltd., a Russian investment firm that again is a shareholder of Facebook and Zynga.